Anchors away! I admit that when it comes to nautical images our selection is quite small. A pair of anchors await your perusal. They’re both in the public domain but hopefully they won’t be the only nautical images on Reusable Art much longer. 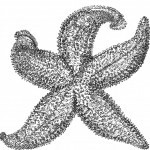 Vintage, black and white starfish drawing from a book about the Isle of Wight that was written in 1848. Simple vintage anchor, clip art for today’s crafters. A vintage, little anchor drawing in soft pastel colors. It reminds me of clip art and could easily pass for a more modern image than one from 1881.